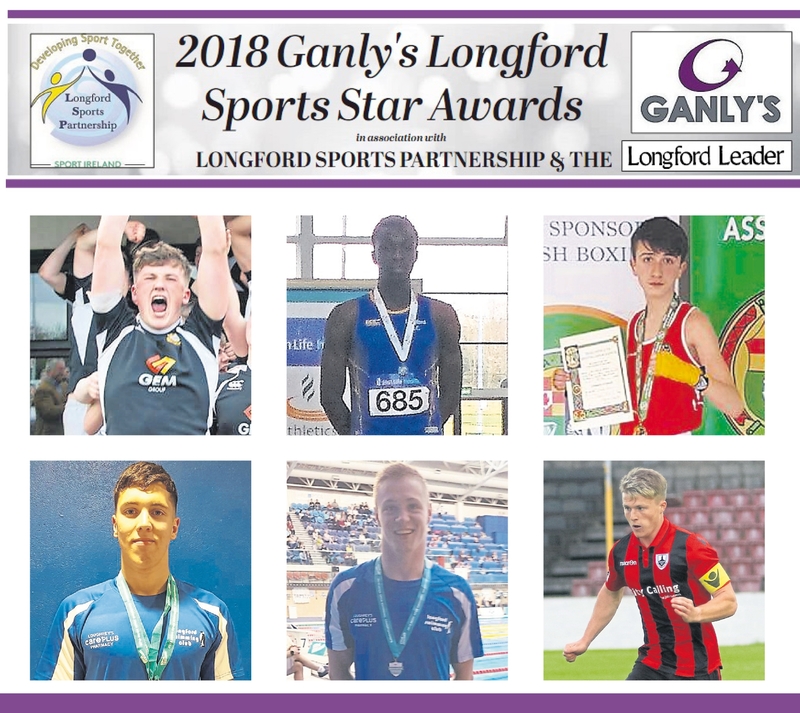 There are six contenders for the 2018 Ganly’s Longford Sports Star of the Month Award for April, in association with Longford Sports Partnership and the Longford Leader. Read below to find out why each person has been nominated. Voting closes at 9pm on Wednesday, September 26. Longford RFC U18s enjoyed a fantastic 2017/2018 season and were crowned provincial double champions, winning the Leinster League Division 1 and the Darcy Cup Final. They defeated Ashbourne 11-3 in the League decider and overcame Boyne by 17-15 in a thrilling Cup showdown. Packie Molloy was the side's inspirational skipper and he played a leading role in both triumphs. Rising Longford boxing star Michael Nugent was crowned Boy 3 38.5Kg champion at the All-Ireland Youth Boxing Finals in the National Stadium, Dublin in April. Michael, who is from Longford town and at the time, a 1st year student at St Mel's College, is affiliated to the Olympic Boxing Club Mullingar and is coached by former Olympian John Joe Joyce and his father Michael Nugent. Longford swimming sensation Darragh Greene completed a magnificent hat-trick of National Senior titles, capturing the Gold medals in the Men 50m, 100m and 200m Breaststroke events at the Irish Open Swimming Championships. Darragh was at his brilliant best in producing a superb performance to set a new Irish record on his way to winning the 100m Breaststroke final at the National Aquatic Centre in Dublin, clocking 1:00.21 in making the consideration time for the European Championships in August and he was subsequently selected on the Ireland squad. Longford’s other swimming star Gerry Quinn won Silver medals in the Men 200m Freestyle and 200m Individual Medley, along with a Bronze medal in the 100m Freestyle over the five days of the Irish Open Championships at the National Aquatic Centre in Dublin. Based in Florida since starting University in the United States last year, Gerry brought great honour to Longford Swimming Club with his excellent three medals exploits in the National Senior Championships. Nelvin Appiah, representing Longford Athletic Club, produced a tremendous performance to win the Silver medal in the U-18 Boys High Jump at the conclusion of the Athletics Ireland National Juvenile Indoor Championships at the Athlone IT International Arena. In the end the result was decided on countback as all three medallists cleared 1.90m but none managed to clear the next height after three attempts. A late goal from resolute defender Daniel O’Reilly clinched a shock win for Longford Town over Shamrock Rovers in the EA Sports Cup second round clash at Tallaght Stadium. O’Reilly got on the end of substitute Evan Galvin’s ball into the area in the 89th minute to finish to the net from close range. Have your say - award nominees sought !! Please include Ganly’s Longford Sports Star Awards in the subject line of your email and the reason for nominating the sportsperson and the date of their achievement. There will also be Hall of Fame inductee, along with awards for Junior Sportsperson of the Year, Community/Club Volunteer of the Year and Sports Ability Award. Exceptional Service to Sport & Recreation – Hall of Fame: Open to any individual who has made a major contribution to sport or physical activity and who has displayed excellent leadership skills.